Has a plastic divider for duplicate checks. Will fit perfectly in your purse or jacket pocket. 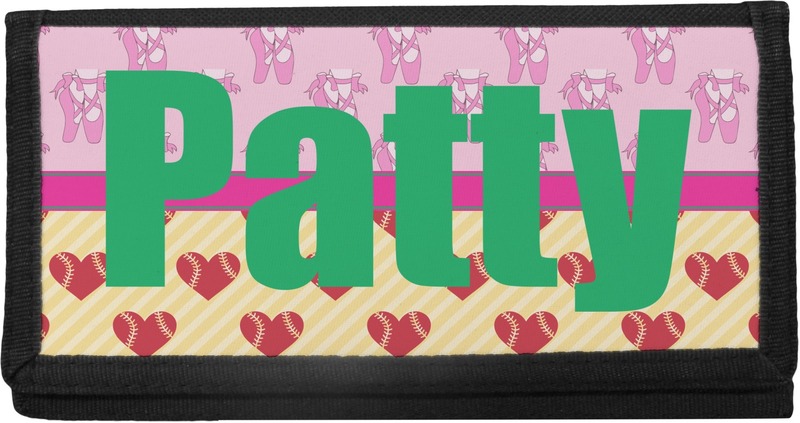 Writing checks will no longer be mundane when you use these personalized checkbook covers. Perfect for keeping cards, cash, and your checks organized. The checkbook cover is made of a durable canvas and the front flap is decorated with a vibrant design of your own choosing. With 4 slots for credit cards or IDs, and 2 compartments for your checkbook register, cash, receipts, business cards and more; this checkbook cover could easily double as a wallet. The cover will fits regular sized personal checks and will work for both side tearing & top tearing checks. It also has a a plastic divider for duplicate checks. At approximately 7" x 3.5" (when closed), this checkbook cover will fit perfectly in your purse or jacket pocket. It is double stitched on its edges for extra durability. 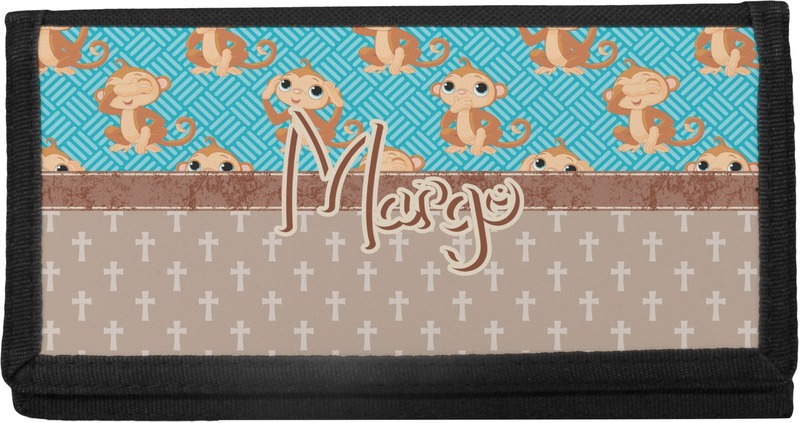 Compared to our vinyl checkbook covers, these are more style oriented. They are thicker and thus made to last. These covers also double as a wallet, while the vinyl cover is solely for your checkbook. Either one is a perfect choice depending on your needs. Now go into the design center to start dreaming up your design! Pick the perfect pattern, font, ribbon, and more to create a design that shows off your personality. If you ever need help or have any questions, be sure to get in touch with us. You will be able to talk to a live customer service agent to help you. Want to compare the two checkbooks? You'll find the slim vinyl checkbook cover in our accessories department. Looking for more accessories? Be sure to take a peek at our faux pashmina scarves and our adorable coin purses. Very happy with it, looks just like the picture I made..and the price was good to,but the shipping price is high.. shipping's high on everything though.. 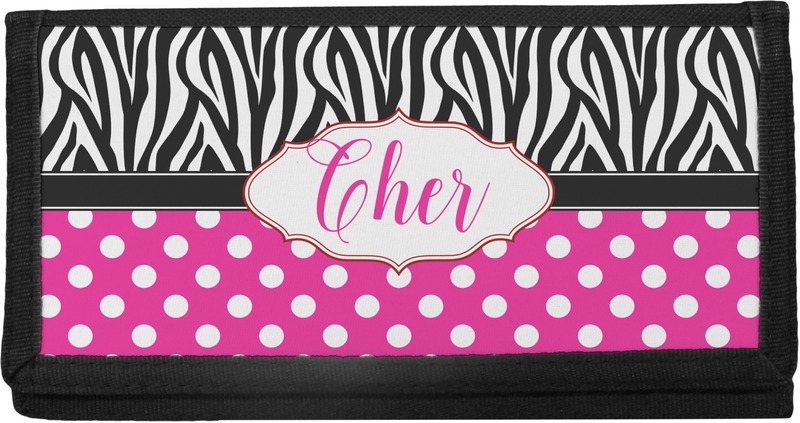 Very nice quality and craftsmanship....I will order from this site for future items and gifts...extremely wide variety to match any customizing options..
We ordered two checkbook covers, one of which is an upcoming Mother’s Day gift. They were perfect! The designs are cute, and the quality of the checkbook cover is better than I expected. Production and delivery was super fast (within 4 days)! We are very pleased! We are really sorry that you were not pleased with initial design / printing. We made the changes as per your phone request and a new check book cover is on it's way to you! Nowhere in the description did it say that the color and personalization were only on the front, and that the back would be plain black. This was a gift and the recipient liked it but was not overwhelmed like I had hoped they would be. Fast shipping though.